From fairy Godmothers to talking frogs, most of us have experienced the magical impact of Disney characters and their stories. However, there is one character that fully embraces the magic and adventure of Disney: the “Steamboat Willie” star, Mickey Mouse. With such a lasting impression, it’s no surprise that there are so many grown-up Mickey Mouse fans. Besides, you’re never too old to be a Mousekateer! That’s why Coppin’s Gift has compiled a list of special gift ideas for the biggest “Mickey-holic” in your life. Accessories – Gift them with an accessory that they can cherish and wear all the time! Check out a nearby department store or browse online for Disney/Mickey Mouse-related bracelets, necklaces, earrings, watches, and more. Disney figurines – Surprise a Mousekateer with a figure that can last a lifetime. Browse through Coppin’s Gifts many Disney figurines from Heartwood Creek by Jim Shore and Precious Moments. 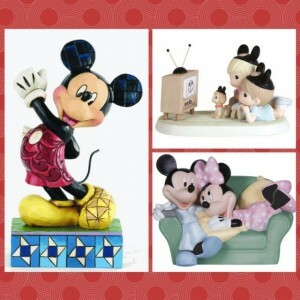 From the Modern Day Mouse figurine by Jim Shore to the Mickey and Minnie Together figurine by Precious Moments, you are sure to find the perfect figurine for a Mickey Mouse fan. Home or Office Décor – From desk sets to cookie jars, you can find an abundance of Disney or Mickey Mouse-themed décor items that are both functional and beautifully ornate for a home or office. Hot dog, hot dog! With many birthdays, holidays, and special occasions coming up this year, make sure your favorite Mousekateer gets a gift that they are sure to appreciate. Browse through Coppin’s Gifts Disney-related Hallmark figurines and sculptures.